Now we are back home I would like to say thank you and how much we enjoyed the whole experience and how pleased we were with the arrangements made by your Gorilla Trekking Group! and experienced staff. I would recommend that anyone considering a trip to Uganda and Rwanda give serious consideration to using the services of AA Safaris. A combination of good service and value for money. 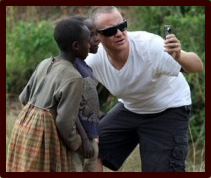 We particularly appreciated being met from and taken to the various national parks, especially Bwindi. All of the guides and agents were very friendly, knowledgeable and helpful and it would be unfair to single anyone one of them out. However we would like to say a special thank you to Tanah in Kampala for going out of her way to help even after the arranged part of the tour was over. Once again many thanks. 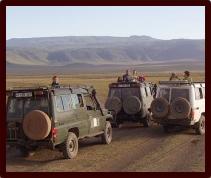 AA Safari Vehicles- Spot me? Green Cruiser! Just a note to say we arrived back home today in Hawaii, USA. 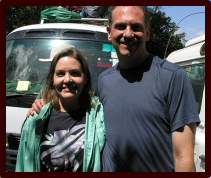 WOW, what a great trip, we booked 9 days safari but felt like it was less since we enjoyed every little bit of the trip. We had the best time, great personal service and our guide Wison and the driver were EXCELLENT!! Thank you so much for making this the best trip of our lives. Now that I am back in the office I would like to thank you for the wonderful organization of our trip. As always you have done a great job organizing the trip and everything was perfect – the guides where knowledgeable and spoke fluent English, the hotels where nice and with very convenient locations, the transportation was comfortable. All the clients enjoyed their trip in Uganda and returned with good memories. Thank you once again! 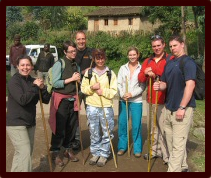 When we started to plan our trekking in Uganda, nearly one year before, we were not After our gorilla safari sure if we should trek with one of the big companies or if we should dare to trek on our own with the help of a guide. 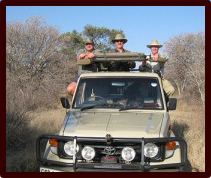 When we found AA Safaris by a friendly advice of one of his former clients and wrote with him, the decision was felt very quickly. All our many mails and questions were always fast, authentic friendly and competent answered by Tanah. So we even knew before we met him for the first time, that we choose the right one. The experience of the mountain gorillas was so great. Even with the bad weather, our safari vehicle was able to persist through the mad. 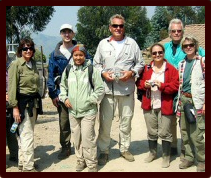 The gorilla resort was our best accommodation, the guide…i won’t mention him, this photo is evident.